Well, I’m about 67 thousand words into my current fantasy WIP, Curse of the Ice Dragon, and I have about another 10-15 thousand to go. I’m working feverishly every day to hopefully get the rest of my book finished within the next two weeks and then I can get back to my newest Whispers novel. 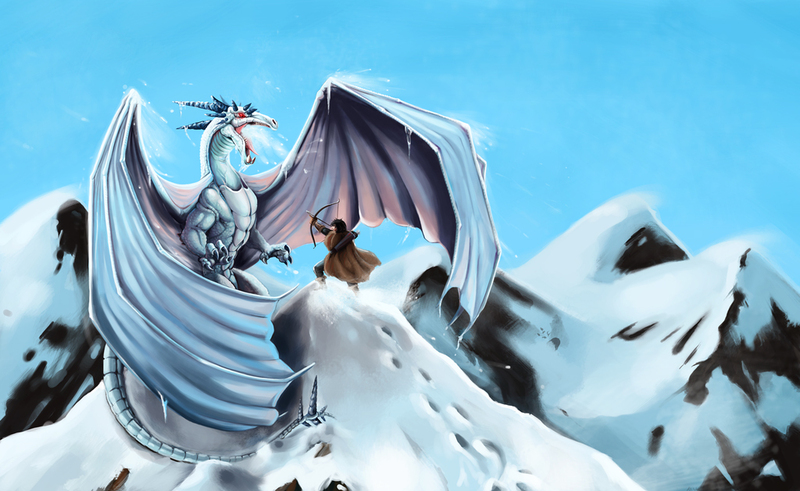 Oh, and I never tire of looking at my Ice Dragon cover by artist Michelle Ulmer (Littlemeesh) from Deviantart. Here’s a link to her page on Deviantart where she has the entire ice dragon poster on display. Isn’t it beautiful? I’ve got to get back to writing. In the meantime, please enjoy this origin myth I created for the inhabitants of my fantasy world, Tehra. This explains the origins of the evil goddess, Madea, in Curse of the Ice Dragon. In the beginning there was chaos, with no division between the land, sea and sky. Only the Elements reigned: air, soil and water, colliding in discord, making Tehra a volatile, miserable planet. The Elements were unhappy with the constant state of unrest and change on Tehra. Since neither of them could exist together in harmony, they knew they needed something stronger and more powerful to rule over them, and bring peace to the planet. The Elements called upon the vast magic of the universe and created the Tryads, immortal keepers of the Elements. Their names were Madea, keeper of sky and spirit; Kyan, keeper of land and breath; and Eris, keeper of water and life. But the Elements made one fatal mistake. They used magic, and only magic, to create the sisters. The Tryads were not of the Elements and so they had little regard for the safekeeping of the planet, save for one of the sisters, Kyan, who loved her land and the people who inhabited it. The Elements had believed the Tryads would rule Tehra peacefully, keeping the distinction between air, land and water, and ending all chaos. The Elements, being simple in nature, had not planned for avarice and greed. Eris, keeper of the fin folk, was unhappy with her station below the surface of the earth. She did not enjoy living among sea creatures and being tethered to an unsightly fish tail. She felt slighted by her air-breathing sisters who lived above her. Madea bemoaned spending her days among the sky creatures, peering down at life below. Her earth sister lived with beings called humans who had built a shrine in her honor. But the bird folk gave Madea no such special treatment. Thus she wished for nothing else than to shed her wings and take her sister’s place as ruler of the human world. Kyan, keeper of the land, felt no such resentment towards her sisters. She had fallen in love with Orhan, a handsome mortal. Together, they had conceived five daughters, each one the exact likeness of her mother and bearing magical powers. Kyan knew of her sisters’ envy, but did not fear them because, along with her daughters, she was more powerful than Madea and Eris combined. But if Kyan had one weakness, it was her love for Orhan. Though he had wealth and power, he, being mortal, was still unhappy with his lot in life and desired sons. Kyan, as a daughter of Elemental magic, could only conceive a likeness of herself. In order to give him sons, she would have to use a different magic, a dark magic – one that came not from land, sky or water, but from the darkest recesses of the soul. Kyan loved her husband and could not deny him his ardent wish, so she birthed him twin boys, Dafuar and Odu. But something changed within Kyan after she’d called upon the dark magic. Her soul had been compromised and her magic weakened. Along with it, her daughters’ magic had been tainted as well. Madea was the first to seize upon her sister’s weakness, flying fast from the heavens and striking Kyan and her daughters with great thunderbolts, sending their souls into the great abyss and reducing their human forms to mere stones. Heartbroken and distraught, Orhan fled with his young sons to the shelter of the shifting sands. When Eris learned of Madea’s treachery, she rose up from the waters, demanding her fair share of the land. Madea refused, and thus began a war between the two sisters. Madea pelted the waters with thunderbolts and hurled great gusts of wind. Eris retaliated with monstrous waves that swept away entire villages and eroded the soil. All the while, the Elements mourned the loss of Kyan and the ongoing destruction of their planet. The world had become chaos once more – something that the Elements had sought to prevent by creating the Tryad. Now they had to act before Tehra was lost forever. As each sister was consumed in destroying the other, the Elements manipulated wind and water, and pollinated their wombs. Eris and Madea each bore five daughters, the Elementals, who grew into adulthood before the first full moon. And though the Elementals had inherited their mothers’ magical powers, they were children of the Elements as well, and owed their loyalty to them, and thus to restoring peace and tranquility. The Elementals forced their mothers to sign a truce. Eris was made keeper of the sea, as well as all of the islands and shorelines. Madea would rule the sky and the mountains. The land in between was given to Dafuar and Odu. But though Kyan’s sons were immortal like their mother, the dark magic used to conceive them had robbed them of their inherent magical powers. They feared they would not make good keepers. The Elementals presented Dafuar and Odu with six sacred stones; each stone had once been the body of their mother and sisters, and they possessed great power. Through these stones, Dafuar and Odu could rule as keepers of the Elements. But soon it became evident that the sons had inherited their human father’s weaknesses, for though they lived forever as immortals, they aged as men. Their bodies became more weathered and decrepit with each passing year, and their memories began to fade. The Elementals, fearing Eris and Madea would find a way to seize the powerful stones from Dafuar and Odu, stole them, hiding them in the darkest recesses of the earth. The Elementals then divided the remaining land between Madea and Eris. Dafuar and Odu left their homes and wandered the earth for ages, searching for something they’d lost, not remembering it was the stones they sought. They lived a cursed life, wise but unwise; immortal, but old and frail. All the while, although Madea and Eris were tethered by The Elementals, their powers grew. Displeased with the shrines built to her by the mortals, Madea built one to herself; a giant palace of ice, rising up from the ground and reaching as far as the heavens. Eris, likewise, built a palace out of fire, which rose up from the ocean; a towering cylinder, shrouded by plumes of smoke and guarded by molten lava. The two sisters had become so transfixed in building their shrines and strengthening their magic, that they had forsaken their duties as keepers of the Elements, paying little heed when ice storms and cyclones ravaged the earth and people. The Elementals, likewise, had no time to manage sky, land and water, as they were most often preoccupied with their mothers. So, slowly, once again, the earth began to crumble. The ice melted, the wind howled and the land shook. The Tryad and the Elementals had failed to protect the Elements from chaos. Now, the people’s only hope of saving their planet lay in hiding, within the powers of the sacred stones. Categories: cover art, news | Tags: cover art, Curse of the Ice Dragon, keepers of the stone, michelle ulmer, tara west, whispers | Permalink. IT’S HERE!!! 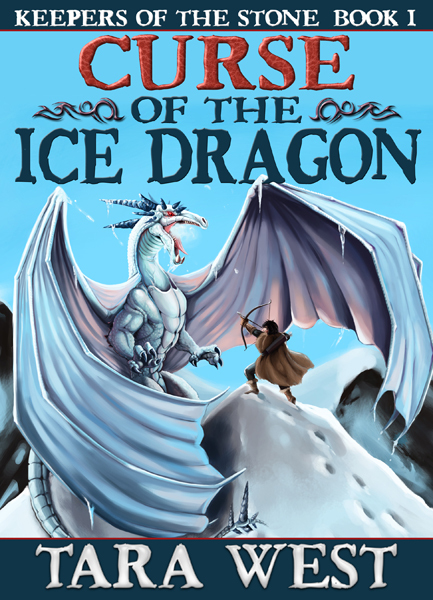 My cover art for Curse of the Ice Dragon! Isn’t it amazing?! As some of you know, I am a graphic designer, but I felt this cover needed the work of a true artist, so I hired Littlemeesh (Michelle Ulmer) from Deviant art. Didn’t she do a fantastic job creating Lydra, my dragon, and my boy hunter, Markus? I did the fonts, but the real credit for this brilliant cover goes to Littlemeesh. I’ve decided to publish this book as an indie, which means I’m responsible for hiring and paying for cover art and editing, but I absolutely LOVE having all of the creative power over my book. After getting my publishing rights back for my YA paranormal series, Whispers, the indie route has paid off, and I’ve sold more books as an indie than ever before. Expect book four in the Whispers series to be released sometime in the fall. I am nearly finished writing Curse of the Ice Dragon, the first book in my Keepers of the Stone saga, which I estimate to be about 75 thousand words. Expect a release in late August or early September. I’ve posted chapter one below, edited by my awesome editor, Vickie Johnstone. A thick mist coated the night sky with an unforgiving chill that stretched across the horizon for miles. The soft blanket of snow had turned to ice, leaving the ground barren, cold and unforgiving. All was quiet beneath the frosted pines. Even the glaciers surrounding the cragged peak of Tehra’s Ice Mountain seemed immobile. No soft winds carried the sounds of animals on the breeze. The only sign of life resided in a small log hut, nestled in a deep valley beneath the mountain. A fire kindled within, but life there was still. Breaths were stilled as faces resembled stone masks of worry. The mother, having used the last of her strength for the final push, slumped against the sweat-drenched furs and fell into a deep slumber. Cradling the infant in a worn, but thick pelt, the midwife placed the bundle in the gnarled, weathered hands of the old prophet. The child’s cherubic face, crimson-flushed from crying, was almost perfect in form and proportions. The only mar on his features was a scar, tracing from the corner of a tiny ear to the tip of his brow. It resembled the shape of a half-moon or a hunter’s bow waiting to be drawn. The many lines surrounding Dafuar’s pale stone eyes belied his age. The ancient healer and prophet was older than any of the villagers, and perhaps even older than the village itself. For his longevity alone, people sought his knowledge, but they also feared him, for many of his dark prophecies had come true. After he’d predicted the great famine, the villagers avoided him, fearing he’d not only prognosticated, but precipitated starvation and death. But Rowlen refused to cower to foolish fears. He was a man, strong and brave. He’d brought Dafuar to his hut this night, hoping the prophet would bless the birth and cast a spell to ward off the sickness that had plagued his firstborn son. Rowlen knew Dafuar was lost in distant memories; knew he would soon conjure up the old tale about the cursed hunter who was killed by the breath of the beast. The prophet had served him well this night, but he had no time for the old man’s foolish fairytales. “Compassion is for the weak, old man. I have no use for weak words — or weak sons.” He shot a menacing glare at a small child crouching in the corner of the room. The child blinked once, and then did not stir. He would have been invisible to the naked eye, so small and quiet was he, were it not for the blinding tufts of pale blond hair that curled around his nightcap and wide, watery eyes that shone with both longing and fear. Only then did the boy resume the ragged rise and fall of his chest. Struggling for each breath, he silently coughed into his palm, having learned to conceal any sign of his infirmity. The boy whispered his thanks to the Goddess that this night he had been given a brother. In his short lifespan, he’d been blessed with neither strength nor skill, but he had been gifted with a wisdom and compassion beyond his four years. He prayed his brother would be compassionate, too. He’d give his last dying breath to make certain the babe did not grow up to become a monster. Markus threw a glance behind him, before coming to a halt. Alec had once again slowed their progress. Tossing his sling and the rabbit carcasses to the ground, Markus went to help him. Although the onset of spring had thawed most of the perilous icy freeze, his brother’s condition appeared to get worse with each melting snow cap. “Even more reason to make haste.” Markus grimaced, knowing his brother’s words were true, but he could not understand why Alec was always the victim of their father’s heavy hand. Perhaps Father knew that if he beat Markus instead, he’d risk injuring his drawback arm and then there would be no more venison stew for supper. Even so, he hated seeing his brother abused. The red and purple splotches on Alec’s pale arms and back were daily reminders that Markus was the favorite child. He should have been grateful that it was Alec that attracted their father’s wrath, but watching his brother degraded and hurt unleashed strange emotions inside him. Anger welled up in his heart every day he witnessed Alec’s torment. Was it not Markus’ destiny to be a mighty hunter and a fearless leader? Hadn’t he already been providing the village with most of the meat for their tables? Yet, when it came to his father, why hadn’t he the courage to stand up to him and defend his brother? Although Alec was twenty winters, and by all accounts old enough to be a man, he had the physique of a juvenile boy and was not strong enough to live on his own. Thus he was forced to endure their father’s wrath in exchange for a warm bed and food. Hardly a life worth living. Markus promised himself that when he came of age, he would make it up to his brother. They’d live in a hut of their own and he would hunt for Alec, give him all the choice meats. Alec would grow stronger then and recover from his sickness. “Do you wish me to carry you?” Markus asked. Standing over a head taller, he looked down as Alec coughed and wheezed through the rattle in his chest. But carrying Alec would be easy work. By his thirteenth birthday, Markus had been blessed with the strength and size of a full-grown man. Now, three years later, he could toss his brother’s hollow bones over his shoulder in one sweep. Sometimes Markus marveled how Alec had lived so long as to reach his twentieth birthday. Each night, Markus had sent a silent thanks to the Goddess for his brother’s fortitude for he truly didn’t know how he could go on living without him by his side. Folding his arms across his chest, Markus exhaled a breath of frustration. What was it about that girl that confounded him so? Despite all of his efforts to help her, she refused, paying him no more heed than the mold growing beneath her boot. Out of all the villagers, she should have desired his hunting skills the most. Her parents had been killed in an avalanche the previous winter, leaving her and her brother to fend for themselves. “I could have killed a bear for her!” Markus felt a surge of anger infuse his skull. Pushing away from the tree, he picked up the rabbits and marched towards home. Girls were so foolish. Why did men see any use for them at all? “They’ve no need for that much meat,” called his brother from the distance, while coughing through his words. Storming through the darkened forest, Markus easily dodged the perilous, winding roots that snuck up from the ground, threatening to trip the hapless wanderer. But he’d traveled this path since he was old enough to draw back a bow. He knew he should slow his pace, but anger fueled his movements, and he was in no mood to be ribbed by his brother. It was not in Alec’s nature to tease him, unless the topic strayed to Dianna. “She wastes her time on the hunt when all she needs is to ask me,” he growled, trudging heavily along the well-worn path to their hut. He wished the venomous words back as soon as they’d slipped off his tongue. Despite Alec’s every effort, girls refused to pay him any heed. Maidens wanted strong husbands who could keep their family well fed. That’s why Markus had no shortage of admiring females. They practically flung themselves at his feet — well, all except Dianna. “More than you, it would seem.” Alec snickered, ignoring his brother’s attempts to silence him. The familiar roar sliced through the frigid air, sending shards of ice-cold fear to the marrow of Markus’ bones. “We’re here, Father,” he called back, regretting the crack of fear that broke through his strained voice. Trudging through a new growth of snake moss, he led the way towards their small hut. A fire kindled through the smoke hole, and freshly washed shirts and trews dangled from a weathered rope. A small patch of newly plowed soil graced one side of the hut. Beneath the majestic backdrop of the snowcapped mountain peak, all would have seemed perfect on this tiny plot of land. Almost as large as a great snow bear and twice as mean, Rowlen had no patience for anything save brewing his many pots of ale. His mouth was draped with a permanent scowl and an acerbic bite of condescension seemed to linger at the end of every word that dripped off his venomous tongue. Eyes darker than stone reflected the contents of his heart — cold and impenetrable. The only things harder than his heart were his meaty fists when they pummeled Alec — almost a daily occurrence. When he was little, Markus learned to recognize the loathing gleam in his father’s eyes just before he was about to strike; knew the exact time to run. When there was no place to hide, Alec would shield Markus’ body with his own. Though it didn’t matter; Rowlen was only after Alec’s blood. As he grew older, Markus became more aware of rumors circulating about him. He’d been born with the mark of the great hunter. He would free their people from starvation. Over the past few winters rumor had turned to reality. As if by a miracle, the more he honed his skills, the more the animals appeared to flock to the forest. At first their father was proud, boasting to the whole village how his son had saved them from famine. And for a short while, Rowlen was happy. With their father’s lighter mood, Alec was spared his cruelty. But his mild temper was short-lived and the abuse would begin again. Markus blamed himself — he thought perhaps Father wasn’t pleased with his hunt. Mayhap if he harvested more animals, Father would spare Alec. But now it seemed that with each fresh kill, Rowlen used Markus’ success against Alec, chiding his oldest son for his incompetence. Markus’ limbs turned to ice and his eyes darted to his father, bracing himself for his angry reaction. Great Goddess! Why had his foolish brother taken the blame upon himself? Markus felt the anger in Alec’s shaky voice and could only stare back at him in awe. “How dare you speak to me that way!” Rowlen raised his hand to strike. Markus turned, and with a shaky hand he grabbed his brother by the elbow and led him to the skinning shack. Still puzzled at how he was able to stand up to Father, his elation was short-lived. This meager defiance meant nothing when so much damage had already been done. When so much violence was still to come. What would he have done if Father had pushed him aside and struck Alec? Would he have defended his brother? Probably not. His quivering innards reminded him that he was a coward. Had Alec not lied, Markus would not have been forced to defend him. For that he was angry, but most of all, he was angry with himself for his cowardice when it came to standing up to their father. “I wish you’d stop,” Markus growled, before turning his back on his brother and tossing the rabbit carcasses on the skinning table. Pulling the boning knife out of his belt, he grabbed a rabbit and pierced the animal just below the belly. “Well, don’t provoke him then.” Markus bit his lip before he said too much, before he admitted his fears. 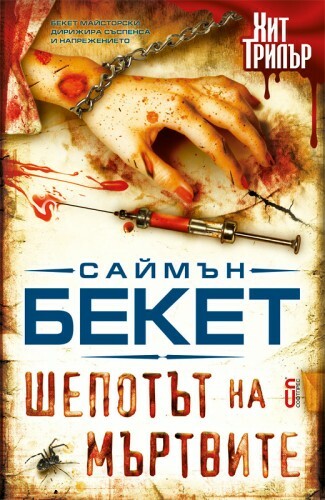 He sliced the blade up to the rabbit’s neck and the blood from the exposed flesh warmed his shaking hand. Taking a deep breath, Markus forced himself to relax, putting all of his effort into skinning the rabbits and trying to block out the memory of his father’s face and the sound of his voice. For a brief moment, he savored the stagnant air, smelling of blood from all of the animals he had slaughtered on the weathered, red-stained skinning table. The pungent odor of the freshly killed rabbit carcasses blended with the old blood. To some the smell would have been overpowering, but, to Markus, the stench brought an unexplained sense of peace. Markus sighed. His brother’s words refused to allow him to push the image of Father from his mind. Besides, Alec was right. Why did Father hate him so? It was not Alec’s fault that he was born with an infirmity and Father’s daily beatings did nothing to improve his condition. But at least Alec had the one elixir that neither Markus nor Father could lay claim to — Mother’s gentle touch, her soft, soothing voice and tender smile. Father had repeatedly told him it wasn’t mannish to savor the soft caresses of a woman, but how he longed for Mother to brush her fingers across his cheek, to hold him and stroke his hair as she did with Alec. But Markus’ hair was as black as the night sky and coarse, like straw, unlike the soft, pale wisps of his brother’s. And he was far too large to fit in the cradle of her arms, while Alec could still fold his slender frame into her lap without crushing her. Of course, Mother only showed affection to Alec when Father was in the barn, drowning himself in brew. Alec would come into the hut with a fresh bruise, his eyes pooled with moisture and Mother would open her arms to him. Markus had no choice but to turn away, an aching in his heart, for he never knew that kind of love from his mother. In one swift stroke, Markus chopped off the head of the rabbit. It rolled down the gentle slope of the table and landed in a bucket beneath. Blood pooled from the empty cavity that was once its head. Repressing the urge to laugh at his brother’s request, Markus pulled down the animal’s innards before ripping them free of its body. A smile crossed his face as the gutting was finally finished. All that was left were meat and bones for the stew. “I cannot help it.” He shrugged before tossing the organs in the bucket. Categories: cover art, news | Tags: Curse of the Ice Dragon, deviant art, dragon book, dragon saga, epic fantasy, fantasy, fantasy novel, Littlemeesh, tara west, Vickie Johnstone, ya fantasy | Permalink. Welcome to another addition of Confessions of a Cover Artist. 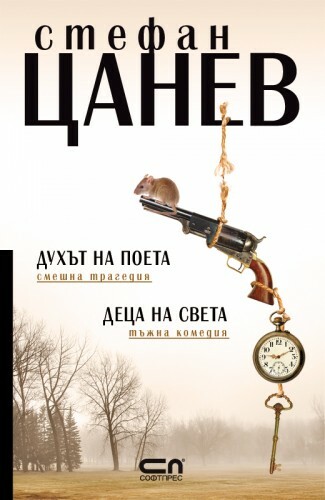 I met Radoslav Donav in a book designers’ group on Facebook and was BLOWN AWAY by his cover art. His artwork truly is in a class of its own. I’m so honored to have him on my blog this week. Even though I can’t read his cover titles, you get the feel of the tone of the books just by looking at the covers. Radoslav was kind enough to provide us with cover interpretations. As you can see, he’s designed for some BIG NAMES. Stunning work. Simply stunning. TW: What training have you had in design? RD: I graduated the New Bulgarian University; my major subject was Visual Arts. I should say that I am grateful that studying there provided me with wide knowledge in the area of art and design. Not to mention subjects such as photography, graphical design, applied graphics, color studies, art history, directing, playwriting, and many others which consequently helped me build a creative approach to solving various practical problems. I had a chance to gain knowledge and experience thanks to the teachers there. TW: What tools do you use to design? Do you use your own photography? Stock sites? RD: I mainly use ADOBE products, mostly Adobe Photoshop, Adobe InDesign and Adobe Illustrator. My collection of images can not fully meet my creative needs, so there is a need to often buy photographs from sites dedicated and specializing in this. Moreover, photography is one of my hobbis and if I have a certain idea, but I unable to find the right image I usually use my ability to shoot. Thus, I give the best of myself, stay satisfied with my life and what I do for living and have fun. TW: When did you realize you wanted to be a graphic designer? RD: Since a child I have been interested in all creative pursuits. At the age of 12 to 15 years I participated in workshops on applied graphics, then enrolled to a theater school and then as an adolescent I played the bass guitar in a rock band, all these activities have given me a lot and thus, I made the choice to do what I have been working on all those years. TW: How did you get into book cover designing? RD: Once finished with my education at the New Bulgarian University, I started working in publishing, where I dealt with historical and archaeological literature, went to archaeological sites, photographed ancient tombs, unique treasures, and subsequently captured and processed materials used for book covers and catalogs sold in Bulgarian museums were among the most interesting years in my field of my work. Since then I have been working as a designer of fashion book covers, magazines and catalogs for 10 years now. RD: I have learned to be patient, I believe that if a project does not happen the first time, it will happen the third or fourth attempt, it is important to keep believing in what you do! From my many years of experience working with many publishers and authors I have gathered knowledge how to achieve a balance between ideas and sponsors cover of my ideas, though I have already designed more than 600 covers of books from different genres! TW: Do you freelance design? 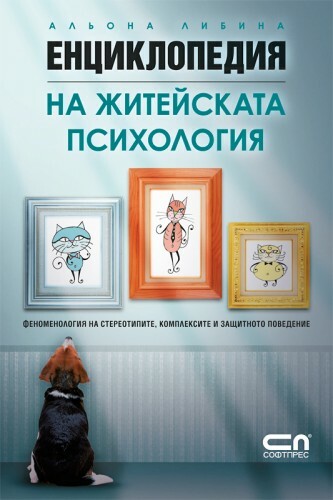 If so, do you only design for Bulgarian clients, or can folks in the United States and elsewhere commission you for cover art? RD: I work for one of the largest publishing houses in Bulgaria, but I do some freelancing at home for private Bulgarian customers. I love my job and I enjoyed the new challenges like this to work for foreign authors and publishers. Moreover, I am definitely interested in new contacts, ideas, further professional development. TW: Please list five elements of a good cover? All these elements should draw the reader to conclusions about the content of the book, not the way the cover is illustrated. Effects should not be all by themselves, but it is good to have them if they help to understanding the plot of the book. TW: What are some of the common mistakes authors make when designing their own covers? RD: Some authors put too long book titles and this prevents the perception of the cover. Too complex and visually loaded covers do not help the understanding of the idea of the book. Sometimes the wrong choice of format and type of paper could also bring a negative impact. TW: What advice would you give to authors trying to design their own covers? The first thing I would recommend is related to the choice of title. It is very important that the title attracts and retains the reader’s attention. It is the title which recreates the atmosphere and emotions in the book to bring information and bring understanding. For instance, if the book is a part of a series, it is quite important for the titles to be related and help the reader recognize the next volumes. In my opinion, it is of paramount importance the title to be short, catchy and is easy to remember! For all other things such as choice of photography, colors, fonts or paper I would encourage authors to refer to professional consultants. TW: What’s your average turn-around for a cover? RD: If the author and I have agreed on all details, it usually takes me no more than 2 to 5 days. TW: Before you get started on a cover, what do you need from the author? RD: The first thing I do is conduct an informal interview with the author about the book and its message to be conveyed. Then, I make a research on the genre and the competition which then helps the author to choose the cover they like, so I get to know a bit more about what the author likes and how to meet his/her expectations. Then we need to come up with 5 key words that the author and I think best illustrate the story of the book and through them I try to build visual metaphors. TW: List one other artist whose work you admire. If you’d like to check out more of Radoslav Donev’s artwork, you can visit his website, or on Facebook or browse his photo forum. Categories: cover art | Tags: Aliona Libina, book cover art, Confessions of a Cover artist, cover art, cover artist, Eve Ensler, Glen Beck, graphic designer, Radoslav Donev, Simon Beckett, Stefna Canev, tamra westberry, tara west | Permalink.